When I was in my teens, I had a vague image of myself in my head that went something like this: at age 50 (which would be really old!) I would be sitting at a roll top desk, writing something significant–at least to me. Well, here I am at 53 (not as old as I thought) and there’s no roll top desk, and I am writing lots of different things. My professional life continues to be a mixed bag, made up of plays, poetry, children’s books, and novels, and lots of conversations with friends and colleagues. I’ll confess it up front…I’m not even close to where I’d hoped to be, but I’m not yet where I’m going either, so all in all, for this journey of rich, diverse, blessed, and quirky happenings, even with a few regrets here and there, I have nothing but thanks. Current projects include Lost Cause (a play inspired by the Civil War), Gray Gus and the Colorbug (along with several other children’s titles along the same lines, for which I am currently shopping with literary agents), and for those who have been asking me about timelines on Arthur: The Wars (The third play in The Arthur Project) and Hunting Grace (Leaving Ruin’s sequel novel), let me just say that 2013 appears to be the year to tie up those loose ends. As far as the blog goes, 2012 was a year of cutting back, mostly to think and reassess what it is I have to say. I’ve needed to focus this work for some time, and again, 2013 appears to be the year. I’ll be ruminating, as usual, about beauty, art, artmaking, writing, spirituality, creativity, and other topics that impact creative work, especially those topics in dialogue with Christian theology and aesthetics. On a personal note, I’ve been married for 31 years to Anjie Berryman, a fabulous woman who is without doubt my better half. She sustains me, is my biggest fan, and I’m grateful for all she’s taught me about love, which, btw, is everything I know. My two children, Amy (24) and Daniel (22), are now firmly settled in New York City, each pursuing their respective dreams of working as professional actors (and I couldn’t be more thrilled for them, or more proud.) And a quick shout-out to the latest addition to the family, Grace Morgan Berryman! In late August, I had the distinct honor of presiding over Daniel and Grace’s wedding, and I must say, my son chose extremely well. Grace is a delight, and I can testify that the name fits. Here’s to years and years of strong and thriving relationship for Daniel and Grace. Thanks for stopping by. I hope you have (or have had) a chance to experience my writing or performing somewhere along the line, and if you see something here that’s interesting, provocative, or attention-grabbing, be sure and comment or email me. It’s always great to connect out here on the virtual road. Jeff Berryman is a writer/actor from Seattle, Washington. As an actor, he most recently he appeared in Taproot Theatre’s Gaudy Night as Lord Peter Wimsey, in Man of La Mancha as Cervantes, and in Brooklyn Boy as Eric Weiss. He toured his solo performance of Leaving Ruin for over a decade, performing throughout the United States, as well as in Canada and Germany. Leaving Ruin is based on Jeff’s published novel of the same name, and he hopes to soon finish rewrites on a second novel–Hunting Grace–the current completed draft waiting patiently on the shelf as other projects take precedence. His current project, inspired by the sesquicentennial of the American Civil War, is Lost Cause, a play he hopes to workshop later this year. He also continues work on his Arthur cycle: Arthur: The Begetting, and Arthur: The Hunt, the first two plays in the projected seven-play project, have both been professionally produced in Seattle, and in 2005, Arthur: The Begetting was featured as part of the Jean Cocteau Theatre’s New Classics Series in New York. His other plays include The Catacombs of Texas, The Carrolls of Queen Anne, The Crèche Collector, The Question of Bethlehem, When Comes the Way, Postmodern Art, and The Little Guy. Other favorite acting roles include C.S. Lewis in Shadowlands, Robert Falcon Scott in Terra Nova, and Jerry Mears in God’s Man in Texas. 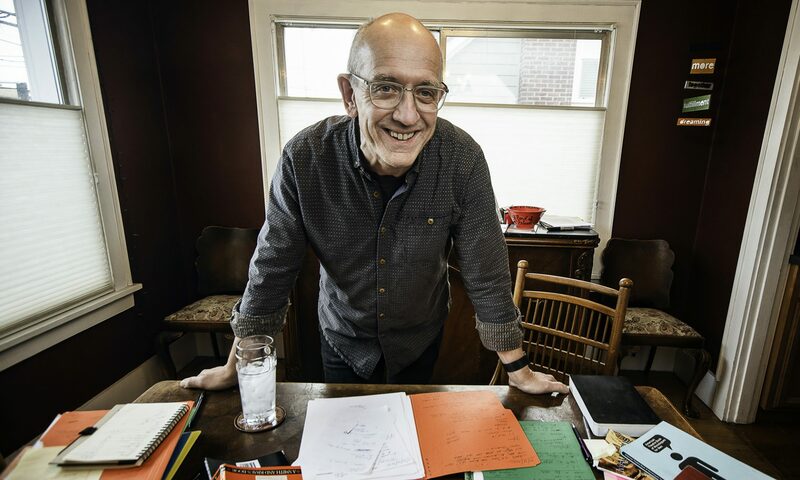 He is a member of the Dramatist’s Guild, a visiting professor at Abilene Christian University, and received his MFA in directing from the University of Texas at Austin. From my earliest days, there has been an sense of presence in my life that I have always identified clearly as God. I have always been moved by His presense and love in the world, and remain astonished that life as we know it exists. The wonder of being a free standing, free creative agent is both miraculous and normal, an overwhelming reality that must be ascribed to something, whether it be a notion of time plus chance plus nothing, or the notion of a personal God who is there and who is not silent, however mysterious his communication with us might be. Beauty is a chief means by which God enters the world, and by beauty I mean a vast assortment of things. I am not a careful philosopher, though I’d like to be, and most readings in philosophical aesthetics leave me grasping for the edges of meaning, and when I’m done, I’m not sure I know more than I did when I started. But beauty is to be found throughout life, throughout the full experience of the birth to death journey, in all parts of the world, in all cultures, all relationships. I continue to believe that there is spiritual beauty and physical beauty, each pointing toward the other, in a kind of metaphoric symbiosis, each real in it’s own right, each embodying the truth about the other. So beauty can be cultivated and nurtured in many ways, always with a hands-in-the-dirt approach, both in art and in relationships. As a follower of the Christ, and as an artist, this is what I am trying to learn to do, albeit in my broken and limping fashion. Very, very cool new place. Thanks for putting me on the Blogroll. I’m proud to be there. I just wanted to let you know that I am thoroughly enjoying your site! Thanks so much for this gift. i stumbled on your site through overstreet’s blog, and must echo katy’s sentiments above: it’s an honor to be on your blogroll. blessings. I did indeed, take the latte picture. It has been a while since we’ve conversed. Life is busy (or should I say full?). Anyway, I wanted to pass this link along. Every time I visit it I get this feeling you’d appreciate what Brad writes about . He is an acquaintance and the brother-in-law of a good friend. He works as a graphic artist and photographer and lives in Langley, BC. hey. send me your phone number. i’m gonna be in seattle this weekend and would love a coffee …. or a beer. i’ve got sunday night free. wanna do a show? Hey, you don’t happen to be from Altoona, PA ever, do you???? Wow! I am totally blown away with your bio and so inspired with your story. God bless you. This is the good part about facebook! And, how about those Eagles? No. 1 in the nation! You say: “Beauty is a chief means by which God enters the world, and by beauty I mean a vast assortment of things.” I don’t think so. I would say: “Love/Grace/Gospel in the Person of Jesus is THE chief means by which God enters the world.” There is not much beauty in what Jesus did to accomplish our salvation on the cross. That is a scandal, a stumbling block, foolishness by worldly wisdom, weakness by worldly strength, ugly and painful and cruel and evil by any person with morals and ethics, and those of legal bent with a devotion to justice. Grace and Gospel are not that beautiful either. Grace is unfair in the presence of the self-righteous, the perfectionist, the holy ones. Gospel makes no sense in the minds and hearts who want to play by worldly rules and standards-think of the parable of the master and his vineyard workers; the workers hired last received the same pay as those who worked their butts off all day long. The prodigal son who carelessly spent his inheritance is the subject of welcome and a huge party, while the eldest son pays for it with his inheritance and has been a responsible son all along. Not much beauty there I would say. But then again, I could be wrong, probably am wrong, and may hopelessly always be wrong–there but by the grace of God go you, go I.
Dim Lamp, scandal, stumbling blocks, foolishness, weakness, ugly cruelty, and the unbending devotion to a legalitarian God is the REASON that God enters the world in beauty. The story of Christ, the Reason for Christ, the sending of the Christ is the reflection of Redemption . . . our return to beauty and to the idea of what He imagined when He thought of us. God’s love is beauty beyond compare and without it we would be lost in the mire of this downward spiral of pure ugliness that our created world has become. I was a good friend of Wes. I worked with him, and then I retired, but I have been substituting for him for several weeks. I am going to finish out this semester. I loved what you said about him, and it made me sad. I’m so happy that you can’t see his family now. I could hardly recognize them from your description. Wow! What an impressive resume. I didn’t know any of this about you before today. I happened upon your name in the process of finding an agent for myself. I have become one of those lucky few who can say I knew you when! You would have known me as Susan Hall from Abilene (Southern Hills Church of Christ) Donny Hall’s little sister–a different world and different life. I will definitely buy and read your book.